Come and spend a day or a half day in the woods with Alcott Smith, tracker, naturalist, and veterinarian. Alcott brings you the forest from the perspective of its inhabitants. He revels in sharing his passion with others and excels in his ability to bring to life the relationship between our wild fauna and its habitat. From sets of tracks will emerge entire stories in the life of the animals who traveled, foraged, hunted and interacted with one another. Anyone with an interest in the natural world will love this program. 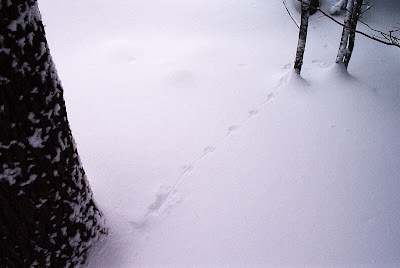 In past programs we have followed tracks to a porcupine in its den, found kill sites with tracks emanating in all directions and have found mouse tracks that end at a set of wing marks. The possibilities are truly endless. This year, he will lead a full day program on Saturday and two 3 hour half day programs on Sunday. Veterans of past programs will be happy to hear that we will be covering some new terrain on the Saturday program. We will spot cars and follow the Poestenkill drainage downstream from Dyken Pond. Pre-registration is required and space is limited. Each session will explore a different area of the Center. Participants are welcome to attend more than 1 session. Please register early by calling Jim Bonesteel at 766-5354, or send an e-mail to jim@dykenpond.org . Participants must dress appropriately for being outdoors, and be physically fit. The Dyken Pond Center is a Rensselaer County Park open daily during daylight hours for hiking, fishing. cross-country skiing and snowshoeing. Call 658-2055, for more information, directions and a complete schedule of our winter events. Animal tracks commonly seen at the Center include coyote, fox (red and gray), bobcat, mink, fisher, weasel, porcupine, snowshoe hare and perhaps this year moose.